We’re genuinely delighted to announce the release of our University of Chicago Spanish-English Dictionary App, extending the benefits of the University of Chicago Spanish-English Dictionary, Sixth Edition (updated with six thousand new words and meanings selected for their frequency of use, rising popularity, and situational necessity) into the digital realm. We invite you to view the app’s video trailer and visit our satellite site, updated with the latest information about the app, the UCS-ED, and a limited-time offer to purchase the book at a 20 percent discount. *** The University of Chicago Spanish-English Dictionary App for iPhone and iPod touch is now available for purchase in the iTunes App store. For more than sixty years, The University of Chicago Spanish–English Dictionary has set the standard for concise bilingual dictionaries. Now thoroughly revised to reflect the most current vocabulary and usage in both languages, this dictionary enables users to find the precise equivalents of the words and phrases they seek on the go, or on their reference shelf. The Spanish–English Dictionary app is a precise and practical bilingual application for iPhone® and iPod touch® based on the sixth edition of The University of Chicago Spanish–English Dictionary. Browse or search the full . 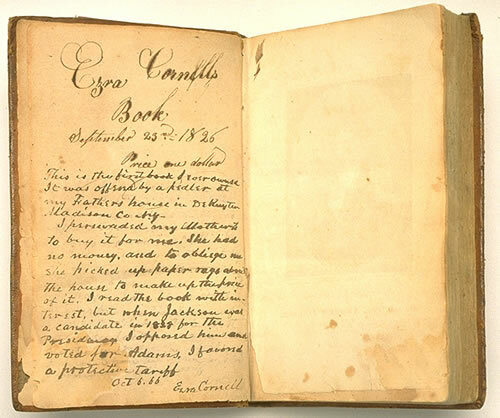 . .
On October 14, Jennifer Howard wrote a post for the Chronicle of Higher Education‘s College, Reinvented blog briefly outlining how short-form ebooks might change the face of serious scholarship. “Ditch the Monograph” considered how the short form might free up scholars to use forms better suited to the needs of their projects—evincing the monograph as the go-to vessel for knowledge production, tenure, and cultural dissemination. Howard mentioned the rise of the digital short—embraced by Princeton UP, among others, as a means of parceling backlist content into digestible highlights and by Stanford UP as a series of original e-books—as a possible inroads to demonstrate that short-form scholarship might be taken more seriously by the academy, ultimately arguing that though “disciplinary gatekeepers” might hold the key, it’s publishers and authors who should be leading the charge to the door. Howard’s piece whipped through the publishing zeitgeist the same week that saw her Chronicle Hot Type article on digital art publishing, focused on Yale UP’s recent efforts with e-monographs. While the current struggle seems to center on finding viable electronic models that can negotiate highly illustrated topics—with red flags thrown up around issues of image rights clearance, digital technology, and the cost of . . . In On the Animation of the Inorganic: Art, Architecture, and the Extensions of Life, Sypros Papapetros argues for an abridged history of animated life, locating the “peripheral” and “eccentric” animated objects at the margins of modernism someplace between Freud’s overdetermined elements and diagrammatic, simulating metaphors of life and movement. He willingly takes on the complimentarity between subject and object that animation infers (at one point citing the response of a young victim to a kind of Pokémon hysteria induced by the rapid flashes and hypercolor intensity of the Japanese cartoon as a seizure both “spatiotemporal and epistemological”). Positing the animation of inanimate objects as part of a deeper project of how twentieth-century modernist culture repressed empathy, Papapetros suggests that the animation of the image comes at the expense of its human subject—which got us to thinking. Watching the commentary—literally watching, since so much is the product of YouTube clips and re-Tumbled images—following last night’s vice-presidential debate has been a stupefying morning experience. My brain has long since been trained to ride the contours of Papapetros’s epistemological shockwaves—more often saturated than not by animated-GIF culture and the new media aesthetic, I’m more profoundly taken aback when my generation’s response to realtime . . .
Laura Letinsky, Untitled #54, 2002. © Laura Letinsky “People want perfection, even if it’s a falsehood,” is the observation proffered by photographer Laura Letinsky in a recent New York Times overview of her work, establishing the stakes her images subtlely, and often intimately overturn. 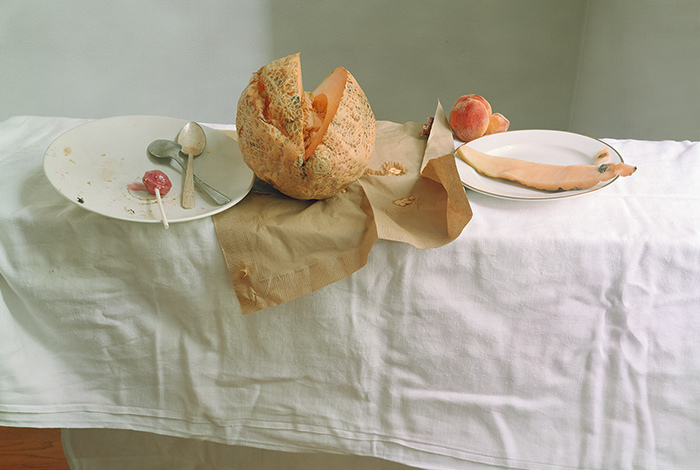 The article goes on to consider Letinsky’s assignments for a variety of glossy magazines—Bon Appétit, Brides, and Martha Stewart Living, among them—that would seemingly eschew her favored aesthetic: the banal objects of our everyday (foods, bodies) in states of disarray, consuming and consumptive, half-eaten, leg-locked, caught mid-meal or in flagrante delicto. But instead of rejecting Letinsky’s painstakingly detailed dis-compositions, these otherwise static, commodity-infused, well-coiffed periodicals have embraced the “tiny details” of her “chaos.” If there is room in late-capitalist culture for a movement like slow food, with its preservation of traditional cuisines and pursuit of sustainability, it might be worth asking if Letinsky’s work responds to a virtual slow cultural hegemony—here the dominant worldview, with its norms that sustain our existence (how we view the rules of eating, sleeping, sexing) still impinges its implications upon us, but our resistance is to strip them bare and backward. Letinsky’s photographs show the world as it is—contextualization isn’t lost, but . . .
John Heartfield (born Helmut Herzfeld, 1891–1968)—montagist, rotugravurer, shock animator, and inspiration for the song “Mittageisen” by Siouxsie and the Banshees—literally changed the face of political art in the twentieth century. 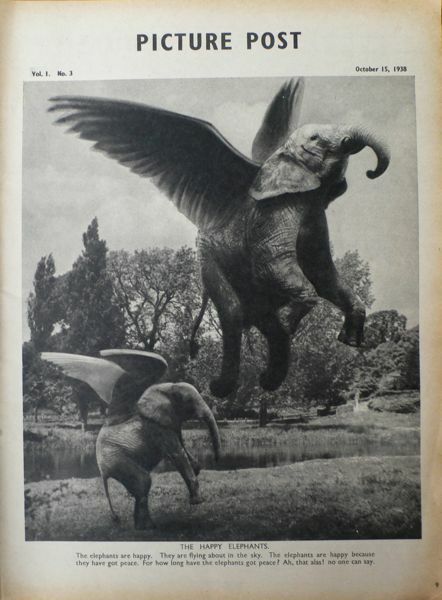 For Heartfield, the montage form he famously adapted not only allowed him to maintain control of legibility—by jarring expectations of genre and content in order to solicit the gaze—but to expose fascism by harnessing images as weapons capable of disseminating information in discursive ways, on as broad a scale as possible. In John Heartfield and the Agitated Image: Photography, Persuasion, and the Rise of Avant-Garde Photomontage, Andrés Mario Zervigón charts the evolution of Heartfield’s photomontage from an act of antiwar resistance into one of the most important combinations of avant-garde art and politics in the twentieth century. What follows below is a short excerpt from the book, which traces then-Herzfeld’s opposition to the war to new acts of performative resistance, found in both new forms and new stakes w/r/t personal identity. *** John Heartfield, The Performance Perhaps not coincidentally, near this moment in June 1917, Helmut Herzfeld informally Anglicized his name as a brazen protest against the war. The first extant mention of this new moniker is in a letter from . . .